knife sharpening | Dare Greatly! My father and grandfather could keep a pocket knife sharp as a razor with an Arkansas stone (a type of wet rock). I’ve never been able to reach that level of sharp. EVER! With anything! I’ve spent tons of money on all kinds of things to sharpen my knives because I’ve been totally spoiled by my dad and granddad. I can not abide a dull knife. I keep several in a favorite coffee cup in the kitchen. CC’s dad used the bottom of one of my coffee cups to sharpen one of his knives and I had to try it. It works. It works well, except it is unwieldy and I wanted something that was smaller and easier to take camping and such. Then I read something on a blog about using ceramic insulators as a sharpener. I already knew from my research that ceramic is one of the greatest sharpeners, so… A quick trip to eBay revealed ceramic insulators for sale for a cheap price. I paid $5.00 for a dozen. I then went to Home Depot and bought a wooden dowel. 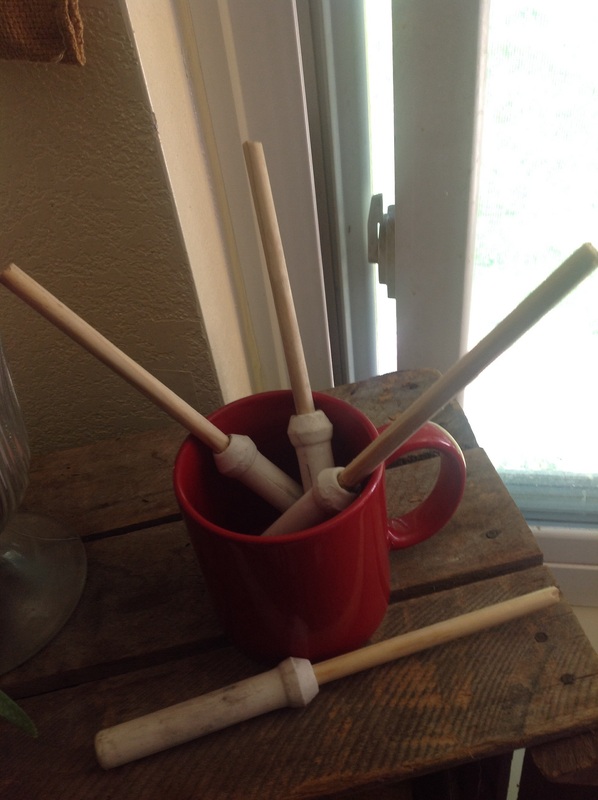 Cutting the dowel into pieces, I inserted them into the insulators as a handle and TA-DA! I have sharpeners that keep my knives razor-sharp. These are not wonder sharpeners in one regards. If you do not know the proper technique for sharpening, I highly suggest you jump on YouTube and check out some videos. Sharpen more than your knives, sharpen you mind by learning something new.